The Cinnamon Fern (Osmunda cinnamomea) is a native North American fern that reach 3' and spreads to form 2' wide clumps. It has twice-cut fronts that taper somewhat at the base and have woolly tufts at the base of the leaflets. Plants produce tall, fertile fronts in late spring that turn cinnamon brown after the spores are shed. Hardy Zones 2 — 10. A Cinnamon Fern has two types of fronds: big green ones, and smaller ones which start out bright green and then turn a cinnamon color. These ferns are vigorous, stately ferns that have featherlike fronds and grow from a thick mat of horse-hair-like roots. Select a site in partial shade with rich soil that ranges from evenly moist and well drained to constantly moist or wet. Site these plants beside a pond or stream, or in a bog garden. To propagate, divide the clumps in spring or fall. Some trees that Cinnamon Ferns grow under include: Red Maple, Eastern White Pine, White Oak, Black Oak, Loblolly Pine, and Virginia Pine. 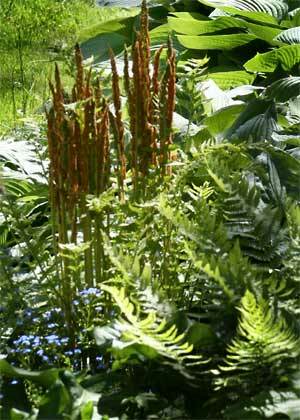 Landscape uses: Use cinnamon ferns as a backdrop in larger gardens. They work well with hostas or in the bog garden with ligularia, rodgersia, and other large, bold perennials. Other Osmunda fern species: Interrupted Fern (Osmunda claytoniana), Royal Fern, Flowering Fern (Osmunda regalis).